Mobile Cloud Computing: Foundations and Service Models combines cloud computing, mobile computing and wireless networking to bring new computational resources for mobile users, network operators and cloud computing providers. 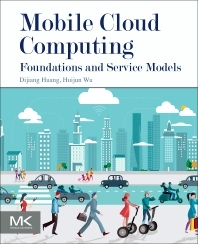 The book provides the latest research and development insights on mobile cloud computing, beginning with an exploration of the foundations of cloud computing, existing cloud infrastructures classifications, virtualization techniques and service models. It then examines the approaches to building cloud services using a bottom-up approach, describing data center design, cloud networking and software orchestration solutions, showing how these solutions support mobile devices and services. The book describes mobile cloud clouding concepts with a particular focus on a user-centric approach, presenting a distributed mobile cloud service model called POEM to manage mobile cloud resource and compose mobile cloud applications. It concludes with a close examination of the security and privacy issues of mobile clouds. Huijun Wu received his Ph.D. from Arizona State University in 2016 with a thesis on 'Mobile Cloud Application Framework and Offloading Strategies'. His research interests are in mobile cloud computing, computation offloading strategies, service oriented architecture and distributed systems. He received a M.S. (2009) and a B.S. (2007) from Huazhong University of Science and Technology. Huijun Wu is currently an engineer at Twitter contributing to the Heron project that is a realtime, distributed, fault-tolerant stream processing engine. He worked in Alcatel-Lucent Shanghai Bell from 2009 to 2011.